The #MardiCity are here . Every tuesday there will be a 2 for 1 for a specific city. Stay tuned on Facebook :) !! Tourisme Laval helped in creating a new touristic attraction on its territory, Escalade Clip ‘n climb Laval. Through the local EPRT program (Entente de partenariat régional en tourisme), Tourisme Laval awarded Escalade Clip ‘n climb Laval a significant grant, allowing this project to be realised. Escalade Clip ‘n climb Laval will open its doors in the Spring of 2014 at the Centropolis. We're now open to the public!! In our first week-end, more than 200 people to try out this new activity at the Centropolis of Laval. Come and see us and try out this new way to climb. 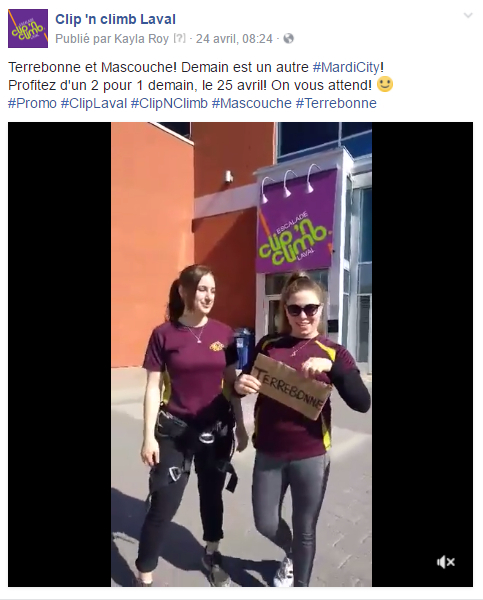 The Promotions Zone activity agency and Escalade Clip ‘n climb Laval signs an exclusive agreement for the promotion and reselling of Clip ‘n climb activities to primary and high school student groups. Promotions Zone is a well-considered and established agency providing turnkey solutions to student groups looking for activities. Promotions Zone was instrumental in developing an offering for student groups which will ensure that they have an amazing time at Escalade Clip ‘n climb Laval. Escalade Clip ‘n climb Laval’s founding partners, Daniel Mongrain and Isabelle Landry Larue were very proud and honored to be awarded first place in the Laval regional Quebec Entrepreneurship Contest for best New Service Company.